Another CDN Women in the IT Channel luncheon has come and gone, celebrating the accomplishments of inspiring women and diversity in the tech ecosystem. Several women were recognized for their work in the channel, but one in particular stood out. 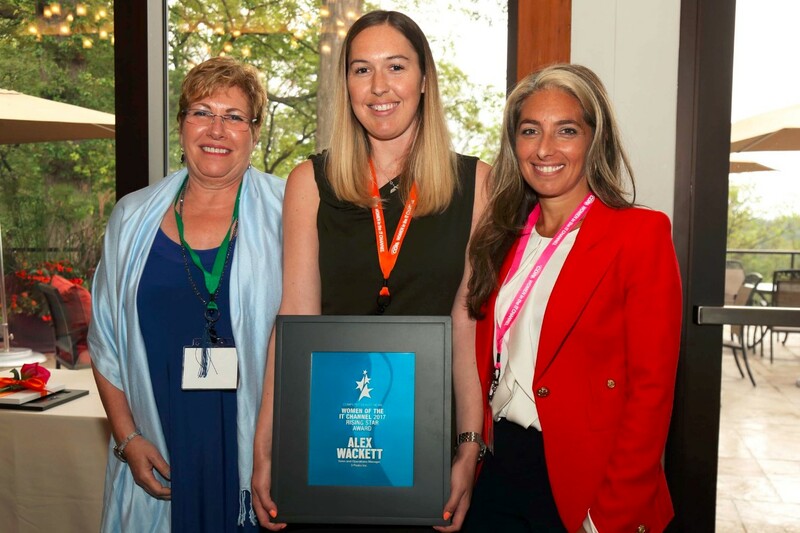 The annual Rising Star award honours an up-and-coming female channel player with less than six years of experience who vigorously supports their company or group. They are someone who brings new innovative programs to life to improve the quality of their business and their industry as a whole, and someone who works hard and well with others along the way. Alex Wackett (middle), sales and operations manager at 3 Peaks Inc., at the 2017 Women in the IT Channel luncheon with Fawn Annan, president and CMO of IT World Canada (left), and Tara Fine (right), channel chief at VMWare Canada. This year’s winner is Alex Wackett, the sales and operations manager at 3 Peaks Inc., an IT business solutions provider. She tells CDN that the award came as a complete surprise, and that she didn’t even know she was nominated. At one time, the Wilfred Laurier University graduate, who has a bachelor’s degree in business and economics, had no idea what the channel was, but found herself seeking jobs in the industry after her university roommate recommended it. Since joining the company in 2011, Wackett has been responsible for managing and building relationships with new and existing customers, selling customized hosting packages, security services, and products, and overseeing internal systems to align with the company’s overall vision and goal. She also manages company acquisitions, including the integration of procedures, policies, and systems. When it comes to the workplace, she believes that people should be chosen based on their skills and what they bring to the job.